The Lisburn community has rallied together to help the pensioner robbed of her life savings last Thursday. And the son of the 91-year-old has put up a £1,200 reward for anyone who can help the police catch the culprits. The family have been devastated after thieves stole Christmas presents, jewellery, and thousands of pounds worth of money Lily O’Hara had been saving to pay for her own funeral. Lily had been out of her Low Road house most of the day when burglars broke into her home last Thursday. It is believed thieves jumped over a fence to gain entry through the back door, ransacking rooms and stealing thousands of pounds. Lily’s son John, who owns a chip shop in Stormont, said he was devastated when he got the call last week. “She had been out all day to the shop that we run and it was 9pm before we took her home,” he said. “Shortly after I left her I got a call to say that she had been robbed. I was devastated. “She lives in what I have always thought was a safe and secure enough area. “When she realised what had happened she called into the neighbours, who are paramedics, who called the emergency services and then contacted me. “I am just glad that she was not in the house at the time because goodness knows what would have happened to her. She would not normally have been out all day. John said that the whole incident has devastated the family. “Mum has lived here for over 60 years and it is a good area, she lives within a mixed community and all the neighbours are all very good to her,” he said. “The whole thing has taken its toll on her. She stayed with me on the Thursday night but when she went home again she ended up in hospital again. She was in an awful state. He explained why his mother had been putting money aside. “She brought tears to my eyes, she said ‘John, it was to bury me’. I think that’s terrible, absolutely sad. Annoyed by what happened the community have helped to fundraise for Lily and have so far raised an amazing £3,300. One of the fundraisers Davy Doran who stood outside B&M, Bow Street on Tuesday evening said, “I lived beside Lily most of my life and when I heard what had happened to her I was disgusted. “She is such a lovely woman and highly respected. Many people have been very generous offering us all sorts. “We just hope that the figure will rise even further. The police are reminding people to ensure elderly relatives and friends make arrangements to store money safely. 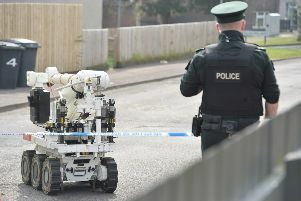 Lisburn Area Commander Chief Inspector John Wilson said: “Keeping any amount of money hidden in your house is a big risk, but this occupant has now lost a considerable amount of savings. “Check with elderly relatives and friends, ask them if they are storing cash, and help them make arrangements for it to be stored in a bank, building society, credit union or any mechanism that ensures the money is safe from burglars.